Unlike most of our other fruit trees which are grafted on rootstocks, field grown and supplied bare root, fig and mulberry trees are produced from cuttings in pots. However, we only supply them with bare root trees in the dormant season. This is because we strongly believe that even pot-grown trees are best planted in the dormant season when the roots can be safely loosed before planting to avoid the tree remaining pot-bound. Click here for a guide to choosing fig and mulberry trees. 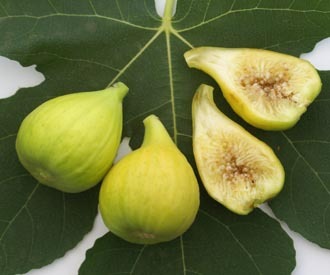 Fig trees are usually associated with the warm sunny climate of the Mediterranean region where they are prolific, but they can be grown very successfully in the UK. While in cooler northern regions they need to be grown in warm sheltered spots, ideally against a sunny south-facing wall or under glass, in warmer southern regions they do well even when grown in the open. Fig trees are fully hardy but severe cold can cause die-back of young shoots and kill off over-wintering embryonic fruit. They are easy to grow and trouble free requiring minimal pruning and attention. Unusually the fruit develops without fertilisation in UK conditions and pollination is therefore not issue. 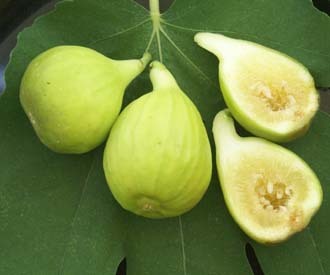 In addition to their delicious fruit, fig trees with their large characteristic leaves and tropical look make an attractive addition to the garden. 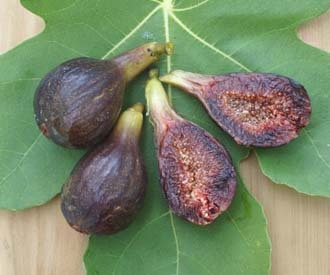 A large brown fig with rich sweet red flesh. The most popular and successful fig for outdoor cultivation in the UK. A fine quality frost hardy yellow fig particularly suited to UK conditions. A high quality black fig. 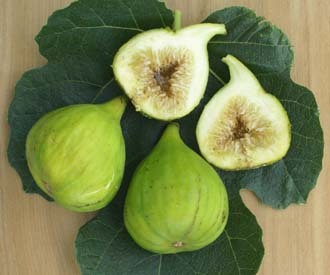 A gourmet fig best grown in a greenhouse or against a warm south facing wall. 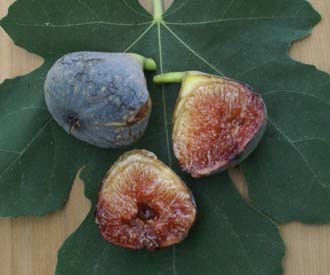 An excellent fig suitable for outdoor cultivation in the warmer parts of the UK. The fruit has a lime green skin and deliciously sweet translucent white flesh. Mulberry trees are distant cousins of fig trees. They are long-lived and despite references in folklore to “mulberry bushes”, can grow into magnificent specimen trees. But they are very slow growing and take a very long time to reach a large size. Only the black mulberry can be grown for its fruit in the UK. The white mulberry, best known for the use of its leaves to feed silk worms, produces a very sweet fruit but requires very hot summers to do so. 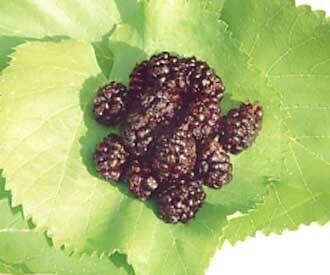 The black mulberry fruit has the appearance of a blackberry. It is important not to pick the fruit before it is ready. It is very sharp and almost unpalatable at the under-ripe red stage. It sweetens rapidly as it turns black and once fully ripe has a distinctive sweet sharp flavour, which arguably is one of the most delicious flavours of any fruit. It is very juicy with a dark red juice - so it is best that you do not attempt to pick mulberries wearing your best white shirt! The fruit can be eaten fresh, used for making jams or used for tarts and desserts. It keeps well frozen. The mulberry tree is easy to grow requiring little attention and minimal pruning. It is also self-fertile and a single tree will crop on its own. A new white fruited mulberry which produces large sweet fruit from an early age. A new dwarf mulberry which fruits from an early age and can be grown in a container. Needs protection from frost.